Bi-directional counting, will subtract count when the direction of the tape is reversed. Tape pitch from 2mm upwards, ideal for counting 0201, 0402 etc. Accurate counting of all components in embossed (black or clear) & punched (paper and plastic) carrier tape. Reel widths from 8mm up to 72mm. Simple operator interface simplifies pitch setting and operation. 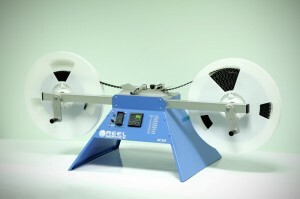 Makes an ideal tape inspection platform in addition to its counting function. Standard configuration allows 7”, 13” and 15” diameter reels to be counted. Standard 22” reels can be accommodated with optional extension arms. Rigid metal construction with a wide, sturdy base. Includes a wrist strap connection point allowing ESD protection when handling static sensitive components. Reel spindles are mounted on bearings for smooth, durable operation. Accepts tape pockets up to 20mm deep, ideal for large connectors etc. 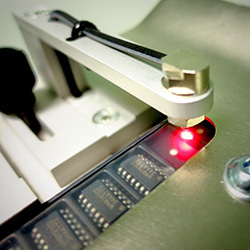 Accurately counts surface mount components in tape and reel. Parts are handled without kinking or bending the tape. Prevent a stock shortage and line-down situation by using the Reel Service IC63 Component Counter to verify exact stock quantities of all your reeled components. The IC63 Component Counter allows you to accurately count taped components in an effective and efficient manner without inducing damage to the components or carrier tape. Counting can also be performed in both winding directions. 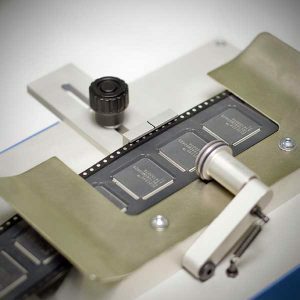 In addition to its primary function as a component counter, the IC63 can also be simultaneously used to assist with the visual inspection of the components in tape and the quality of the tape seal if desired while winding the tape from reel to reel. Dimensions: W-30 x L-79 x H-40 cm.